I have purchased a bunch of the prints & canvases for both of these new Disney paintings myself to sell up at strangeling.com , and I can ship WORLDWIDE! These are the two ©Disney pieces that debuted at my Princess Portraits event at Pop Gallery at Downtown Disney here in Florida last Saturday. Both were 16x20" Acrylic paintings on panel ($6400 each, both originals SOLD at the show, sorry folks! ), licensed Disney© artwork as part of some upcoming projects for the Hamilton Collection (figurines & other merchandise will be available soon - yay!). Prints and canvases of Ariel in "Part of Your World" are HERE featuring Flounder & Sebastian! As these prints are made by the publishers for Disney (not by myself, like most of my prints usually are), the sizes & prices are a little bit different than usual. Shipping costs will depend on where you live, options are available in your shopping cart. You can also purchase the canvas prints in person at Pop Gallery Orlando here at Downtown Disney in Florida. Unfortunately with the WonderGround Gallery Exclusives (unlike these two new ones from Florida) I am not able to sell them on my website as I live too far away to purchase them myself to re-sell. WonderGround Gallery however is always happy to take orders via email or phone and they also ship worldwide. Please see the links above & info at Strangeling.com . My next Disney art event will be July 12th & 13th at WonderGround Gallery at Disneyland in California! Details on that upcoming eventare HERE. 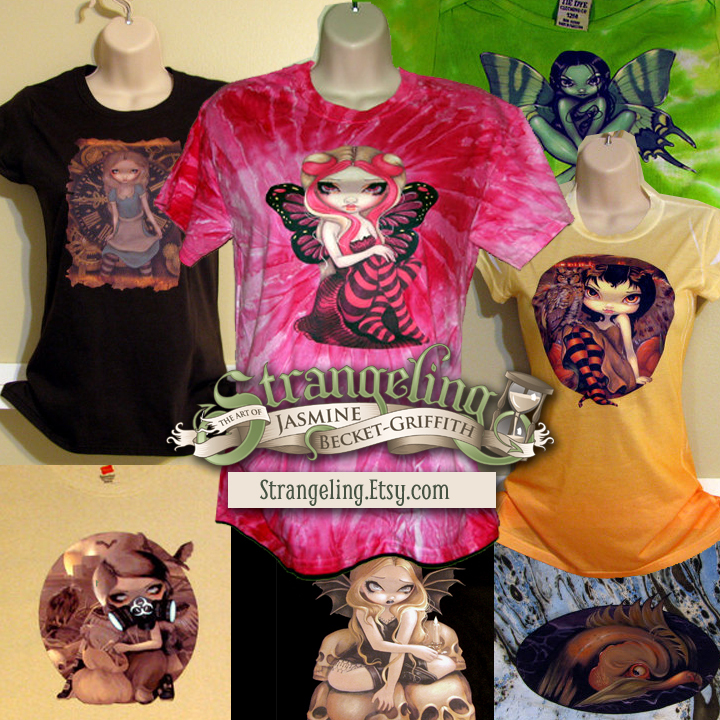 EDIT: We have added a few more new shirts from our initial batch - check them out at Etsy in our clothing section!